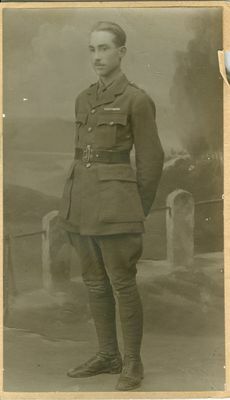 A black and white photograph of Allan Davidson in uniform. A black and white photograph of Allan Davidson and (presumably) his mother and father, and two women sitting on the steps in front of a house. A typed letter from Allan Davidson to his mother. Sent from Florence, Italy. A typed letter from Allan Davidson to his mother. Sent from Italy. A typed letter from Allan Davidson to his mother. Sent from Italy. Recounts the events of the Battle of the Piave. A typed letter from Allan Davidson to his father. Sent from Italy. A typed letter from Allan Davidson after the end of the WWI. Sent from Italy. A typed letter from Allan Davidson to his mother. Sent from Trieste, Italy. A typed letter from Allan Davidson to his mother. Sent from Milan, Italy. A black and white photograph of Allan Davidson holding a small animal, (presumably) the dog named Gyp. Black and white photograph of Allan Davidson and (presumably) his mother and father sitting on the steps in front of a house. A Handwritten letter from Allan Davidson to his mother. Sent from Italy.